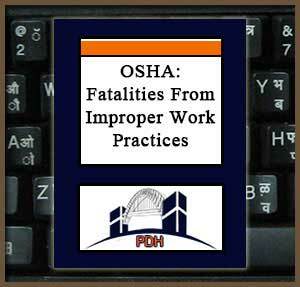 This course is based on case studies taken from the Occupational Safety and Health Administration’s “Fatal Facts” —descriptions of accidents in which one or more workers died because of improper work practices. Reading and thinking about these case studies gives an immediacy and emotional impact—“Do you mean somebody died because of this?”—that can’t be obtained from an abstract discussion of general principles alone. This course is intended primarily for civil, construction, mechanical, and industrial engineers and others who are responsible for employee safety and OSHA compliance in potentially hazardous occupations.